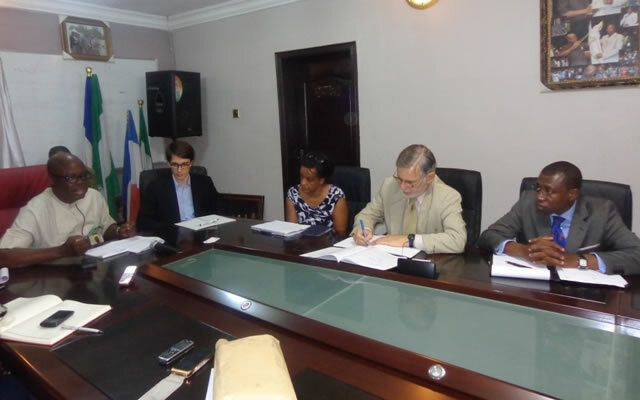 A four-man delegation from the World Bank led by Antoine Costewas last week hosted at the National Secretariat of the Association of Nigeria Licensed Customs Agents (ANLCA) in Lagos. The team which had been moving round several countries to collate the challenges hampering international trade, transport and logistics were at the ANLCA Secretariat where they met with the relevant players in the private and public sector as well as held talk on the constraints in the ports and border statins as regard facilitating trade across international borders. Delivering his welcome speech, the National President of ANLCA, Prince Olayiwola Shittu told the visiting World Bank team that ANLCA is a world-class organization respected at home, as a thorough professional body as well as admired abroad. He informed the team that ANLCA is a member of the International Federation of Customs Brokers Associations (IFCBA), which is affiliated to the World Customs Organization (WCO). Shittu also told the World Bank delegation that ANLCA is a registered member of the Council for the Regulation of Freight Forwarding in Nigeria (CRFFN) established by an Act of the Federation, Member of Cargo Alliance, Break Bulk and so on and has won an award as the best Customs Brokers Association in Africa. According to him,” ANLCA has been consistently seeking avenues of sustaining capacity building within the association. So, in March, ANLCA will be heading to China to learn more about trade facilitation and seamless port operations. In May, ANLCA will be heading to Seoul, South Korea to deliver lecture at the gathering of IFCBA members from across the globe”. On the overcrowding of the ports, the ANLCA National President hinted that 60 percent of the people at the ports were not supposed to be at the ports. He highlighted that CRFFN registered five associations to carry on the business of moving cargoes across international borders. He listed the associations to include the Association of Nigeria Licensed Customs Agents (ANLCA), National Council of Managing Directors of Licensed Customs Agents (NCMDLCA), National Association of Government Approved Freight Forwarders (NAGAFF), Association of Registered Freight Forwarders of Nigeria (AREFFN) and National Association of Air Freight Forwarders and Consolidators (NAFFAC) saying that all these associations have their areas of professionalism except the Licensed Customs Brokers which he said has a defined role in the industry. Shittu further maintained that a hundred percent examination of cargoes was still the order of day, in most cases after scanning was carried out adding that the system in no small measure contributed to cargo exit delays. Interferences from some banned government agencies in the ports according to him, had contributed to hamper cargo delivery due to the incentives accruing to them from continuous extortion of hapless customs agents. On the profiling of importers by the Nigeria Customs Service, he said that the exercise was halted because majority of the importers lacked honesty, integrity and compliance buttressing that profiling would have facilitated trade but regretted that the reverse was the case as majority of declarations were wrong. He went on to reveal that trade in this clime cannot be facilitated because the emphasis of the federal government on revenue generation rather than on trade facilitation. The ANLCA boss therefore appealed to the World Bank delegation to impress it upon the federal government of Nigeria to pay at least 1 percent of the total revenue generated to the Customs Brokers for their efforts in scouting for and urging the importers to pay their dues. He contended that if that if that would be bone done, it would impose on the clearing agents a sense of patriotism in order to ensure that all duties and levies were paid to the government knowing fully well that a portion belongs to them. Responding, a member of the delegation, Lamin Jarju extolled the intelligence of the ANLCA National President whom he said was intelligence personified. He promised on behalf of his colleagues that the World Bank would keep in touch with the association on matters relating to cargo clearance in the sub-region and beyond. Highlight of the visit was the decoration of the World Bank delegation with ANLCA broach formally inducting them as honorary members of ANLCA. Picture Caption: ANLCA President, Prince Olayiwola Shittu addressing the World Bank team. Sitting right after him is the leader of the delegation, Antoine Coste. (Note the picture is for the first story).